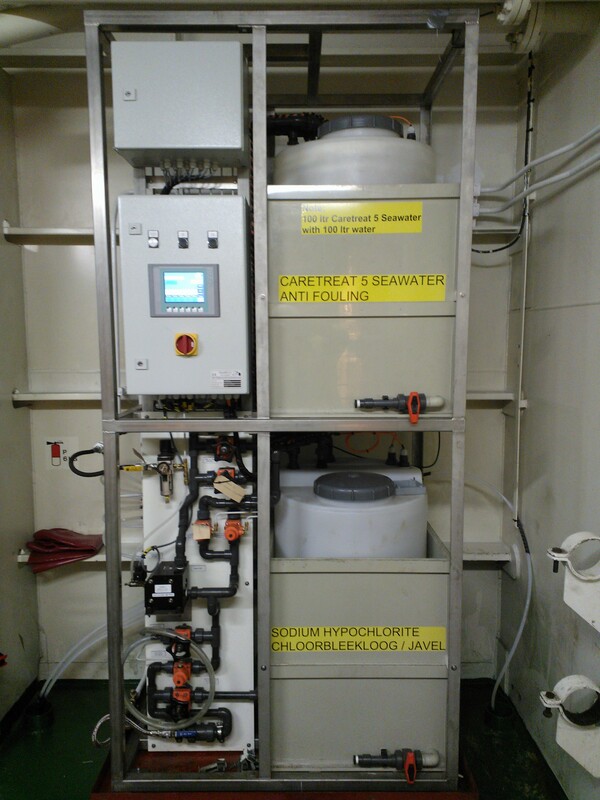 Aquality is your specialised partner in industrial or marine water and fuel treatment processes. This includes know how, chemical products, dosing units but also measuring and control equipment. These dosing units comprise units for cooling water, drinking water, boiler water, fuel treatment and sea cooling water chemicals. Measuring and control units for the monitoring of boiler water and condensate or complete drinking water monitoring systems for passenger vessels are designed and produced in our company. For the chemical and product tanker market, Aquality produces a wide range of mixed bed demineralisers – if needed including measuring and safety equipment. Aquality is sales- and service agent for Innospec Marine Specialties, the world’s largest producer and supplier of Heavy Fuel Additives for the Marine market. Other activities are the agency of Bandelin Ultrasonic Cleaning equipment. We are specialised in the design and delivery of customised cleaning units for Marine engine parts such as pistons, cylinder heads, air coolers and turbo chargers.